We are very happy to announce that after a second round of jury deliberations, SWA’s Los Angeles office won the Pudong Foreshore Waterfront Competition. Strategically located between the Huangpu River and the Outer Ring Expressway, the project site is approximately 283 hectares of waterfront open space with a 2.3 km shoreline. 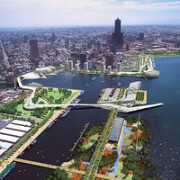 Sited immediately south of the Shanghai Expo Site, the project aims to produce a visual centerpiece for one of the last remaining waterfront parcels along the Huangpu River. SWA enlisted the team at Morphosis to design iconic waterfront structures, contributing to the cohesiveness of the design and ultimately producing a project that adds to the dynamism of Shanghai. 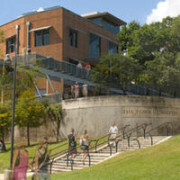 The project is projected to break ground Spring 2013. What is the key to successful urban development? Todd Meyer explains that “people want to be where the action is.” Meyer recently participated in a panel on cultural urbanism at the Urban Land Institute’s Fall Meeting, emphasizing the importance of place in development projects. 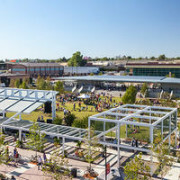 Pointing out key SWA projects like City Creek Center in Salt Lake City and Buffalo Bayou in Houston, Texas, he notes that social interaction through the understanding of local traditions and culture produces the perfect formula for successful spaces. From restaurants to athletic clubs, vibrant community-gathering spaces create an attractive environment for residents as well as economic viability for developers. 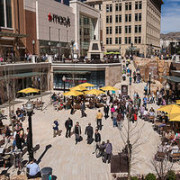 Learn more on cultural urbanism and the ULI Fall meeting here. How can designers approach the challenge of place making in areas with a rich cultural heritage, while laying the framework for growth and sustainability in the future? SWA, along with Bing Thom Architects, is tackling this complex issue in their winning design for one of the world’s largest infrastructure projects: a new gateway to the West Kowloon Cultural District in Hong Kong. 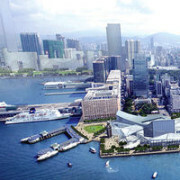 The new district will symbolize the importance and rich history of Chinese Opera, also referred to as Xiqu. The center is conceived to support and promote Xiqu as a contemporary art form making it accessible to new audiences and keeping this remarkable piece of Asian heritage alive for future generations. Completion is planned for late 2016. What is the catalytic potential of development near the iconic Dodger Stadium, a point of cultural and ecological identity for Los Angeles? In a joint venture with Cal Poly Pomona’s Department of Landscape Architecture, SWA’s Laguna Beach office partnered with the undergraduate studio for a 10-week investigation of urban design issues for Dodger Stadium and its surrounding parking lots. “Poised for one of the most unique urban adaptations within the city of Los Angeles, Dodger Stadium is a rare testing ground for locally-based urbanism that leverages the ecology, culture, and geography of the city,” the studio explained. The project both introduced a new generation of students to urban design issues and also proved a rich laboratory for generating innovative and exciting design ideas that explored the potential of capital investment to spark new opportunities. 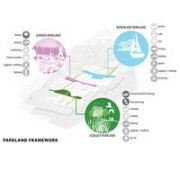 The design explorations looked at a series of frameworks to encompass ecological, social, economic, transportation and service infrastructures to create a new “hybrid” downtown district that could balance between park and city, as well as community and entertainment. The Dodgers offered their support based on 50 years of experience operating the world-class franchise in LA. 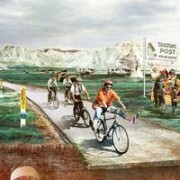 What if the Keystone XL Pipeline was a bike path? This was the question designers from our Houston office started asking when considering the possibility of the Keystone XL Pipeline approval in 2014. If so, we had better start thinking about viable alternatives for what kind of environment that development will create, and how we can make it better for people. While the proposal is all speculative at this point, we want to ask real questions about what happens if these projects go forward, and how to create projects that have added benefits. Check out the full feature on Fast Co Design or watch Kinder Baumgardner talk about the project to Current TV’s The War Room. What becomes of a former steel mill in Bethlehem, Pennsylvania? Sands Bethworks, formerly comprised of mill buildings, blast furnaces, and office buildings, is now a vibrant mixed-use retail development that includes a casino, hotel, and museum. 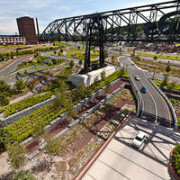 The sites’ stunning landscape design implements green initiatives such as bioswales and demolition material reuse, while maintaining a visual cultural history of the Bethlehem Steel mill. Check out the slideshow of inspiring images from our recent site visit. Over the holidays, SWA Group and a team of more than 70 volunteers were hard at work cleaning up the Dominguez Creek Corridor near Los Angeles, CA. 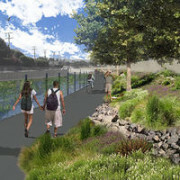 The project is part of DEEP (Dominguez Enhancement and Engagement Project), whose goal is to “revitalize 20,000 square feet along the Dominguez Creek with native plants and trees, benches, a bike trail, interpretive signage and a community mural.” Prior to improvements, the area was characterized as undesirable, unsafe and unusable. To begin the transformation of the corridor, the group planted 21 new trees and more than 600 shrubs and groundcover plants, initiating the ongoing revitalization process supported by the local community. Follow the progress on Dominguez Creek on SWA’s blog for updates! 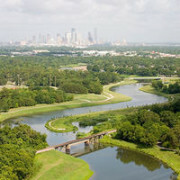 More changes are coming to Houston’s Buffalo Bayou! City officials just announced that the landmark Sunset Coffee Building on Allen’s Landing will be undergoing an $8 million renovation. Architects Lake/Flato, BNIM, and SWA are transforming the former 1960’s-era psychedelic club into a bike, kayak and canoe rental facility on the ground floor, and offices for the Buffalo Bayou Partnership located above. The top floor and rooftop terrace will be available for private events with views of the downtown Houston skyline. Groundbreaking is scheduled for April, with construction expected to conclude Spring 2014. As higher education institutions are trending towards a re-urbanization of their campuses, designers are faced with large-scale development in dense, urban spaces. 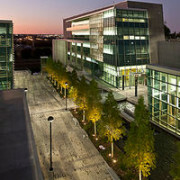 SWA had the opportunity to work through this complex design challenge with Tarrant County College in Fort Worth, Texas. The resulting plan centers on a central spine, including roof gardens, courtyards and unique streetscape elements that draw people through the elongated campus and encourage student interaction. Through the integration of indoor and outdoor educational platforms, SWA’s design weaves an urban landscape that offers students and visitors common outdoor space typical of a college campus, while providing a framework for future expansion. Our photographers made several trips over the past several months to document an incredible number of projects being built from all seven of our offices. 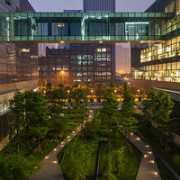 Trips to China captured Shenzhen Bay’s re-imagined coastline and the corporate campus for Symantec Chengdu, while domestic projects photographed include UC Davis’ new West Village net-zero residential community, and the Tulsa Riverfront Park designed as a flooding landscape. Paying homage to author and social activist Jack London, Oakland’s version of a ‘mixed-use wonderland’ underwent a modest “nip and tuck” by SWA’s San Francisco office. Designed with flexibility in mind, the updated landscape is designed to work with the existing framework and cultural history of the place, while still maintaining a garden-type, human scale. 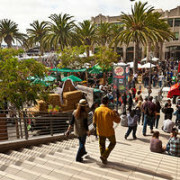 The new Jack London Square has public spaces and connections along a five-block long mix of offices and shops anchored by a grid of palm trees lining three distinct squares. 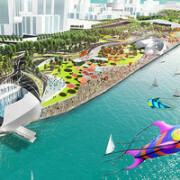 Click here to learn more about SWA’s design strategies for the project. Coastal Resilience, an umbrella organization comprised of local Gulf Region Universities as well as SWA’s Houston office, have been focusing on how to prevent the monumental damage caused by powerful storms that ravage the area every few years. The last major storm, Hurricane Ike, cost the region $24 billion in estimated damage to the Galveston Bay area. The Coastal Resilience teams are “exploring alternatives that combine a natural-system approach that work with nature’s tremendous forces, in combination with engineered structures – both new and existing ones – that would support protection zones around existing cities and critical industries.” These recommendations to local, regional and Federal jurisdictions have the potential to offset as much as $19 billion in damage from the next big storm. Featured in the Huffington Post Green, CEO Kevin Shanley details recommendations and innovative solutions proposed by the Coastal Resilience teams. A stunning detail of SWA’s Gubei Pedestrian Promenade in Shanghai graces the cover of the December 2012 issue of Landscape Architecture Magazine. Focusing on pedestrian spaces and public promenades as a vital oasis for residents amidst the chaos of busy cities, the design demonstrates how in fast-growing cities like those currently being developed in China, sustainable infrastructure can provide usable and beautiful public outdoor spaces. Constructed from 2006 to 2008, Gubei Pedestrian Promenade has shifted the narrative of the potential of public spaces in dense urban environments and serves as a model for other developers to understand the impact of prioritizing pedestrian-only passages and corridors within larger projects. 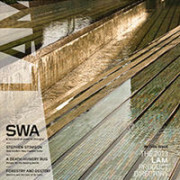 The December issue is currently available as a free issue on Landscape Architecture Magazine’s website. How can great design improve our cities? Gerdo Aquino, President of SWA, spoke on how cities can maintain a leading edge and be successful in the future by embracing a multi-faceted urban design approach. “Leading edge design happens when technology, politics and culture converge and move together at the same pace. This not only makes the work relevant, but highly desirable by its users, and sustainably and economically sensible. Results generate an aesthetic that is ecological and performative while also being socially responsible and creatively functional.” The conference, sponsored by the College of Arts, Media and Design and the Northeastern Center for the Arts, focused on designing sustainable cities from three angles: the science of design, the policy of design, and the business of design. Northeastern University held its City Design and Sustainability Symposium in February in Boston, Massachusetts. Experimentation and innovation is an essential part of the design process, and SWA has recently launched a forum for studio members to express their ideas and explore new areas of design leadership. 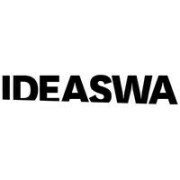 IDEAS highlights topics such as Landscape Infrastructure, Bayous and Social Impact Design, creating a space to further discourse and initiate design thinking in the field of landscape architecture, planning and urban design. Recent articles discuss the necessity for building resilience in cities, innovative infrastructural systems in Dallas, and the growing friction between pedestrians and cars. 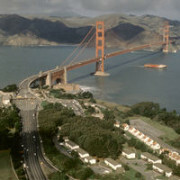 On Thursday, April 4th at the Old Federal Reserve Building in San Francisco, the Golden Gate National Parks Conservancy, the Presidio Trust, and the National Park Service received a Stewardship Excellence Award from The Cultural Landscape Foundation to honor and acknowledge their decades of stewardship at the 80,000-acre Golden Gate National Recreation Area. One of our greatest national treasures and oldest national urban parks, the Golden Gate National Parks annually greets more than 16 million people. Managing Principal Rene Bihan serves on the board with The Cultural Landscape Foundation, and our designers and photographers have been hard at work on a series of videos of the parks. Check out the feature documentary with stunning photography of the parks, as well as interviews of the many stewards and designers who have made this park possible over the decades. Congratulations to designer Steve Rydzon in SWA’s Laguna Beach office, for beating out 20 other proposals for a new sculpture project at Lantern Bay Park in Dana Point, California. 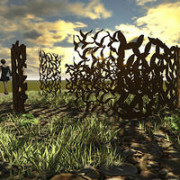 The City of Dana Point described the purpose of the competition as encouraging “creativity, education and an appreciation of the arts and our cultural heritage.” On January 15th, the Dana Point City Council voted unanimously to approve plans for his piece, ‘Offshore Forest,’ a kelp-inspired Cor-Ten steel sculpture. Located in a vacant space overlooking the harbor, the sculpture plays off of the characteristics of the coastal waters below, with steel panels that will be laser-cut with patterns “mimicking an underwater kelp forest.” The project is expected to be completed later this Spring. 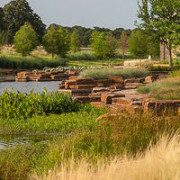 The teams from Houston and Dallas have received a record-breaking thirteen awards from this year’s Texas ASLA Awards. In “Design-Unrealized” category, Tangshan Fangshan National Geology Park, Sanya Haitang Bay Resort, Sino-Singapore Nanjing Eco-Tech Island, Nanjing AVIC Science and Technology Center, Yuan Dang Lake, and Old River Park were award winners. In Design Constructed category, Deloitte University, Rosemont bridge, Tarrant County College, and Victory Park all received recognition. Airline Market Mile and Coastal Resilience were recipients in the Planning & Analysis category, and Las Ventanas received the Classic Award. We’re thrilled to be part of so many award-winning projects and excited to have so many teams be recognized by ASLA. Of the many luxury resort properties in Cabo, only two received the 5 Diamond award this year: both are projects designed by SWA teams. 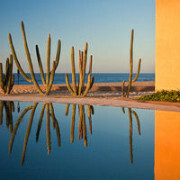 Capella Pedregal rests at the confluence of desert mountain and the Sea of Cortez, offering guests a design that celebrates both Mexican architecture and garden heritage mixed with modern design. Las Ventanas al Paraiso explores the drama of the harsh desert climate, with design strategies that allow for a low-density site plan to preserve site features and provide every unit with a panoramic view to the horizon.